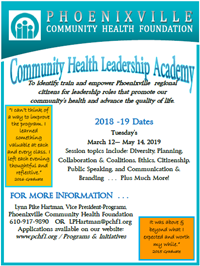 The Phoenixville Community Health Foundation Board of Directors approved the development of a Youth and Philanthropy Program within regional School Districts. The program was designed to provide students with an opportunity to learn about philanthropy, giving of one’s self to address the neediness of others, and to learn about it first hand. 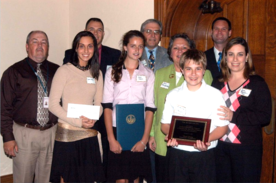 2005 the Youth & Philanthropy Program received the Chester County Community Foundation’s ACORN AWARD for youth in philanthropy. In 2009 the Program received the Association of Fundraising Professionals Philadelphia Chapter’s Youth in Philanthropy Award. You can also read Villanova University’s review of our Youth and Philanthropy progam. This program is offered as an independent study curriculum, for students grades 10-12, that can be linked to the Senior Project graduation requirement. The students meet twice a week with a program facilitator chosen from school faculty and approved by the Foundation. These students form their own philanthropic group, deciding on their mission and philanthropic focus. The Phoenixville Community Health Foundation provides a philanthropic fund for the students to utilize. This program draws from 8th grade students and utilizes teachers as program facilitators. The program is offered as part of the school day, meeting several times a week. The Phoenixville Community Health Foundation provides a philanthropic fund for the students to utilize. This program draws from 8th grade students and utilizes teachers as program facilitators. The program is offered both during the school day and as an after-school activity. The Phoenixville Community Health Foundation provides a philanthropic fund for the students to utilize. This program draws from 8th grade students and utilizes teachers as program facilitators. The program is offered during the school’s Club Session as the Philanthropy Club. The Phoenixville Community Health Foundation provides a philanthropic fund for the students to utilize. This program draws from the freshman, 9th grade, students and utilizes teachers as program facilitators. The program is offered as an after-school program. The Phoenixville Community Health Foundation provides a philanthropic fund for the students to utilize.